In traditional method of cooking Vindaloo, you must marinate the meat for at least 24 hours. However, for a quicker version you can omit that step. Remove lamb from the marinade. 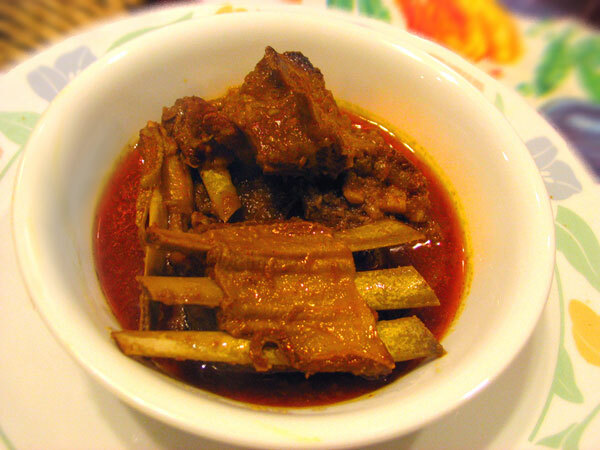 Heat ghee in a vessel and fry meat to brown. Remove meat and set aside. Add onions and fry for 5-7 minutes. Let the onions get almost brown. Bring the saved marinate mixture into fried onions, mix and move away for 2 minutes. Due to mustard and hot chilies the fumes might be too much to handle if you are close. Return and keep stirring until the masala is fried into a nice paste. Add meat and 1 cup of water. Continue cooking on high heat until the gravy starts boiling. Add ½ tsp Sugar and mix. This step reduces the sourness a bit. Vindaloo is ready to serve. though honestly i have not tried but this one seems to be interesting. greattttttttttt!